Bobby Hatfield died November 5, 2003. He was 63. For nearly four decades, the Righteous Brothers defined the essence of "blue-eyed soul." Together and as solo artists, Bill Medley and Bobby Hatfield reached generations of fans with their unmistakable, heartfelt vocal style. From their 1965 chart-topping success with "You've Lost That Lovin' Feeling" to 1990's surprise rediscovery of "Unchained Melody," the Righteous Brothers endured and thrived as legendary talents. What explains the duo's evergreen appeal? Perhaps it's the raw emotion which Medley and Hatfield conveyed as singers. There's also the knack they had for choosing timeless, immaculately crafted songs to record. "Unchained Melody," featured in the film 'Ghost,' became a platinum single in early '91 when the duo's newly recorded version sold more than one million copies. The song also earned them a Grammy nomination in the category of "Best Pop Performance By A Duo Or Group with Vocal." 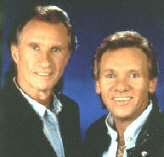 The re-recorded "Unchained Melody" was included on "Very Best of Righteous Brothers - Unchained Melody" (released October '90), as well as on "Reunion." The return of "Unchained Melody" to the charts some 25 years after the Righteous Brothers first recorded the song is nothing short of amazing. The stirring, achingly romantic power of their music has truly stood the test of time. Medley and Hatfield first became "brothers" after both were performing on their own around their home turf in the Los Angeles suburb of Orange County. They sang together one night, and the audience response convinced them to stay together. They quickly developed a stage act which featured the urgent back-and-forth vocal exchanges that went on to become their trademark. Medley's soulful, rich timbre was the perfect compliment for the higher-pitched, gospel-tinged range of Hatfield. The duo first recorded for the small Moonglow label, releasing a series of singles (including their first hit, 'Little Latin Lupe Lu') and their debut album "Right Now." But their real rise to prominence began when they started working with producer Phil Spector. 1965 saw the release of "You've Lost That Lovin' Feeling," which matched the Righteous Brothers' passionate singing with Spector's famed "Wall of Sound" to monumental effect. The song topped the charts and led to further hits, including "Just Once In My Life," "Unchained Melody" and "Ebb Tide." Switching labels to Verve, the duo enjoyed further chart success with the million-selling "(You're My) Soul And Inspiration," as well as "He Will Break Your Heart" and "Go Ahead And Cry." Then, in 1968, Medley and Hatfield parted company and embarked on solo careers. Medley had several hit singles, including "Brown-Eyed Woman." Medley and Hatfield joined forces again in 1974 and scored another hit with "Rock And Roll Heaven." This reunion proved to be short-lived, however, and the duo split up once more. Yet the Righteous Brothers' legacy proved too vital to leave to the pop history books. The appearance of "You've Lost That Lovin' Feeling" on the soundtrack to the film "Top Gun" was but one sign of the Brothers' long-lasting appeal. The duo continued to perform together on a semi-regular basis through the '80s, most notably on a 20th Anniversary reunion tour in '82. As a solo artist, Medley achieved much success, making his biggest breakthrough with his 1987 Number One single "(I've Had) The Time Of My Life," a duet with Jennifer Warnes from the "Dirty Dancing" soundtrack album. When "Unchained Melody" became one of 1990's biggest hits after its inclusion in Ghost, no one was more surprised than Medley and Hatfield. "I feel that the popularity of the song is just a miracle," Hatfield told the Chicago Sun-Times in an interview. "I've always loved it, but never expected the public's reaction to it to be quite this feverish and strong." Combined with the airplay that the original version of the song was receiving, it seemed the perfect time to reunite the Righteous Brothers as a recording act once again. They went into the studio together for the first time since 1974 with Medley producing. The sessions, which resulted in the tracks heard on "Reunion," showed that Medley and Hatfield's powers as singers remained unique and undimmed. The 1990's saw a new generation of fans discovering the magic of the Righteous Brothers. Bobby Hatfield will be missed. Remember him through his music. booking entertainment, such as major name entertainers or celebrities, booking The Righteous Brothers, booking information on The Righteous Brothers, or hiring The Righteous Brothers for your special event, or to book or hire The Righteous Brothers, or if you are seeking The Righteous Brothers booking agent for corporate entertainment or for a private party. Consider the opportunity to book The Righteous Brothers or other entertainers for a wedding, birthday, anniversary, business meeting or convention. If you are not a talent buyer, we are unable to provide The Righteous Brothers manager or management contact information. Consider this your official The Righteous Brothers booking agency web site – The booking agent who works for you! This company acts as an entertainment consultant or broker/producer and does not claim or represent itself as the exclusive agent, representative or management of The Righteous Brothers. The Righteous Brothers, rock music artists - booking agent. This group may be available for your event. Book them if you can. You will have the time of your life!